More good news: a Tweeters poster reports that Seattle City Light now has placed a sign at the Agg Ponds that specifically says that bird-watching is a permitted activity there. So no more anxiety about whether it's possible to bird there! Hello Birders! I am the Wildlife Biologist for Seattle City Light in charge of managing the 10,300 acres of wildlife mitigation lands in the Skagit, Sauk, and South Fork Nooksack watersheds. As indicated by Jane Hadley comment, SCL welcomes all birders and wildlife enthusiasts to visit any of our properties. Unless otherwise posted, the SCL lands are open for daytime recreational uses (no littering, fires, motorized vehicles, or cutting vegetation). The sign at the junction of Martin Ranch Road and Barnaby Slough Road does say "PVT RD" on it. I hope to take it down sometime but but there is absolutely no problem with you driving in the short road to the rock barrier to park. There's good news to report on Barnaby Slough access, Cindy. Much of that Barnaby Slough property up there is owned by Seattle City Light as part of their conservation efforts to mitigate for the Skagit dams. I spoke to a wildlife biologist for City Light, who said they'd love for birders to bird at Barnaby Slough, especially if they report their sightings to eBird. There were some problems with vandalism and littering, but the city put some large rocks short of the slough, which is probably where the "Private property" sign is. There is space for about two cars to park there (about 300 feet in from Martin Ranch Road). From the parking spot, walk in past Harrison Slough to the Barnaby Slough. You can walk west along the slough's southern shoreline. Walking east takes you to Nature Conservancy property, which may not be open to the public. The biologist said he may take that "Private property" sign down. Barnaby Slough Road is listed as a private road on the sign. Is this a change, or is this still an accessible location? After being present annually since the early 1990s, there hasn't been a Veery found at the Agg Ponds since 2013. American Redstarts continue with multiple breeding territories each year as of 2017. The North Cascades Highway (SR-20) is now open! Later than usual, but earlier than feared. WSDOT is predicting a late opening for SR-20 (North Cascades Highway) this year because of heavy snow pack. It's possible it won't open until June. The winter closure runs from MP 134 on the west side (east of Diablo) to MP 171 on the east side (14 miles west of Mazama). Re: Eric's question about the sign at the agg ponds, two years ago I called City Light to ask about the sign. I was told it is ok for birders to walk in behind the gate. I don't know how long the sign has been there. It would be good to know if others have more information. I was around Newhalem this weekend and tried to bird the Newhalem Agg Ponds. The gate was closed with a sign on it that said "no unauthorized personnel past this point" or something like that. Has this sign always been present? Or is this a new sign that birders should be heeding? Boreal Owl has been heard at Rainy Pass, on Pacific Crest Trail maybe 100 yards from south parking lot. At night, of course! 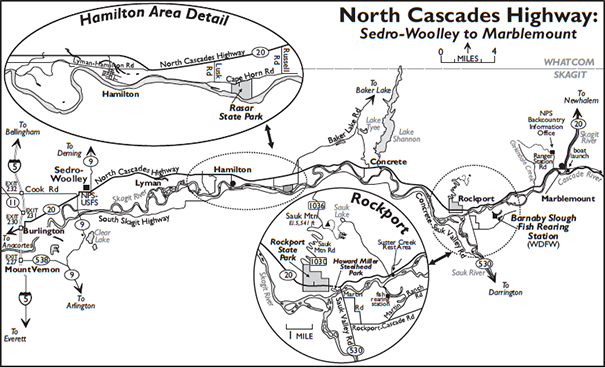 From near sea level on the floodplain farmlands west of Sedro-Woolley, the North Cascades Highway (SR-20) follows the Skagit River eastward for 95 miles, ascending gradually to 5,477-foot Washington Pass. The route traverses several vegetation zones with a diverse and contrasting birdlife. Lower slopes are famous for damp, old-growth forests of Western Hemlock, Western Redcedar, and Douglas-fir that may reach heights of 200 to 300 feet. Broad swaths of luxuriant deciduous growth line the streams. Higher-elevation forests of Silver Fir give way to parklands with stands of Mountain Hemlock. Above treeline is an area of meadows and jagged, glacier-laden peaks that has been called North America’s Alps. The best times to visit are from May through October. During spring, summer, and fall, some of the many species to be found along the way are Barrow’s Goldeneye, Sooty Grouse, Golden Eagle, Northern Pygmy-Owl, Black and Vaux’s Swifts, Hammond’s Flycatcher, Cassin’s and Red-eyed Vireos, Gray Jay, Clark’s Nutcracker, American Dipper, Mountain Bluebird, Townsend’s Solitaire, MacGillivray’s Warbler, American Redstart, Black-throated Gray and Townsend’s Warblers, Slate-colored Fox and Lincoln’s Sparrows, Lazuli Bunting, Gray-crowned Rosy-Finch, Pine Grosbeak, and Red and White-winged (irregular) Crossbills. In most years, the highway closes around the first of December and does not reopen until April. However, it is open year round below Newhalem. From mid-December through January, when Chum and Coho Salmon are spawning, the Skagit River between Rockport and Newhalem provides food and shelter to 300–500 Bald Eagles. No gasoline or other services are available between Marblemount and Mazama, approximately 70 miles. 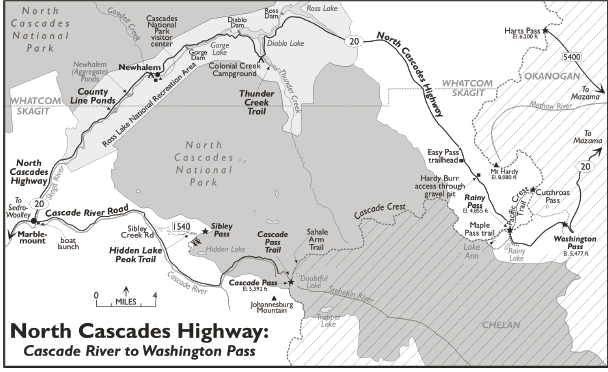 For much of the itinerary described here the highway corridor passes through the North Cascades National Park. Park information is available on-line at www.nps.gov/noca. For updates on camping reservations, backcountry travel, and road closures, call 360-854-7200 or stop by any of several visitor centers and ranger stations along the route. A stop at the National Park Service/U.S. Forest Service office in Sedro-Woolley to pick up maps and a North Cascades National Park bird checklist is an excellent way to begin your trip. From I-5 Exit 232 north of Burlington, follow Cook Road east 4.4 miles to its intersection with SR-20 (North Cascades Highway). Turn left and proceed 1.1 miles to the intersection with northbound SR-9. The office is on the left just before this intersection (open 8AM to 4:30PM Monday through Friday year round, and Saturday and Sunday from Memorial Day weekend at the end of May through Columbus Day in mid-October). Continue east for 14.7 miles on SR-20 and turn right onto Lusk Road just past the town of Hamilton. In 0.7 mile, turn left onto Cape Horn Road, then right in 0.8 mile into the Rasar State Park entrance. This 128-acre park, situated on the north bank of the Skagit River in a mixed-forest habitat, is best visited from May through September. Look for Northern Pygmy-Owl, Red-breasted Sapsucker, Downy and Hairy Woodpeckers, and resident/migrant passerines, including Pacific-slope Flycatcher and Cassin’s Vireo. Turn right onto Cape Horn Road for 1.3 miles, then left (north) onto Russell Road to return to SR-20 in 0.8 mile. The town of Concrete is about six miles farther east along SR-20. In another mile, east of Concrete where power lines cross to the Skagit River side of the road (0.8 mile past milepost 89), note the Osprey nest-platform on the south side (for the past two years this platform has hosted a pair of Canada Geese rather than Osprey). Continue east for 6.3 miles and turn left onto Sauk Mountain Road (FR-1030), an improved gravel road that winds upward to the Sauk Mountain Trailhead. At 1.6 miles, park at a gated logging landing and check the brushy hillside for Rufous Hummingbird, MacGillivray’s Warbler, and Black-headed Grosbeak. In 1.4 miles, at milepost 3, stop to look for Townsend’s Warbler. In 4.5 miles turn right onto FR-1036. In May and June, the last stretch of road to the trailhead (0.3 mile) is a good place to look for Gray Jay and Slate-colored Fox Sparrow. The 2.1-mile trail leads to alpine meadows on Sauk Mountain (summit 5,541 feet, elevation gain 1,040 feet). Watch for Sooty Grouse, Olive-sided Flycatcher, Hermit Thrush, and several species of warblers, sparrows, and finches. In July, the wildflower display is spectacular on these slopes. Return to SR-20, turn left, go 1.6 miles, and turn right onto SR-530 (Sauk Valley Road). The entrance to Howard Miller Steelhead Park, along the north bank of the Skagit River, is on the right in 0.2 mile. You may find Ruffed Grouse (drumming in spring), Band-tailed Pigeon, and Vaux’s and possibly Black Swifts flying overhead. At the west end of the campground, a footbridge will lead to trails that traverse swamps and woodlands along the river. Look for Osprey, Bald Eagle (winter), Red-breasted Sapsucker, flycatchers, warblers, and sparrows. The park can also be good for surprises, such as Iceland Gull, Dusky Flycatcher, Western Kingbird, and American Redstart. The past few years the campground has hosted several pairs of nesting Bullock’s Orioles. Cross the Skagit River on the SR-530 bridge and turn left onto Martin Road (0.3 mile from the park). At 0.2 mile is a small wetland with Willow Flycatchers, Warbling and Red-eyed Vireos, and an assortment of warblers, sparrows, and finches in spring and summer. A public river access 0.2 mile farther along Martin Road offers similar species. In the shrubby areas beside the road, look for Western and Eastern Kingbirds and Lazuli Bunting. Rarities are possible: Sage Thrasher and Yellow-breasted Chat have been found here. At a T-intersection in 1.3 miles, turn left onto Rockport-Cascade Road, then left again in 0.9 mile onto Martin Ranch Road. In 1.2 miles, turn left onto Barnaby Slough Road (rough graded) and drive a quarter-mile to a parking area and an interpretive display. If the gate is locked, park adjacent to the road; do not block the gate. Barnaby Slough (Discover Pass required) is a mosaic of habitats that provides excellent spring and summer birding. (Keep out November–February when the area is closed to provide sanctuary for waterfowl.) In addition to the usual lowland forest birds, the area has been good for vagrants, including Black-and-white and Chestnut-sided Warblers (one June record for each). Retrace your route to SR-20 and turn right. Sutter Creek Rest Area, on the right in 2.4 miles (at milepost 100), is a great place to watch wintering Bald Eagles close-up (best before 10AM when they are foraging and interacting). The meadows between 2.5 and 3.0 miles farther east at Corkindale Creek often swarm with swallows (six species possible and the best place in Skagit County to find Bank Swallow). Watch also for Willow Flycatcher, Western and Eastern Kingbirds (rare but annual), Lazuli Bunting, and Bullock’s Oriole. Just over two miles from Corkindale Creek, turn left onto Ranger Station Road and continue 0.5 mile to the intersection with Powerline Road. Check along this road for a quarter-mile in both directions. Lazuli Buntings are dependable here. Ranger Station Road ends in 0.3 mile at the National Park Service’s Backcountry Information Office. Return to SR-20 and turn left (east) toward Marblemount. A side trip up the Cascade River Road to the Hidden Lake and Cascade Pass trailheads offers good birding in summer and fall, and magnificent scenery. Allow one full day for this trip. Note that the last few miles of the road are usually not clear of snow until the beginning of July. In Marblemount, where SR-20 makes a 90-degree turn to the left (north), stay straight onto Cascade River Road across the Skagit River bridge. Immediately turn right into the parking area for the Marblemount Boat Launch. This location is a good place to look for spring and fall migrant songbirds. To the north, across Cascade River Road, is a good place to look for Mountain Bluebird in spring. Back at the parking area take the trail that winds through a field along the Skagit and Cascade rivers, returning back to Cascade River Road 0.1 mile east of the parking area. Along the trail you may see Townsend’s Solitaire and Nashville Warbler. Alder Flycatcher, Say’s Phoebe, and Tennessee Warbler have all been observed here. As you continue to drive the 23-mile road to the parking area at Cascade Pass Trailhead, watch for Barred Owl, Common Nighthawk, Red-breasted Sapsucker, Varied Thrush, Black-throated Gray Warbler, and other lowland forest species. Views from the trailhead are breathtaking. You are in a U-shaped trough, glacially over-deepened, with steep valley walls, waterfalls, swift streams, and avalanche chutes grown to Sitka Alder thickets; similar terrain stretches north through the Coast Mountains of British Columbia and Southeast Alaska. Listen for the roar of falling ice as you view a series of hanging glaciers on Johannesburg Mountain. Cascade Pass Trail winds along a series of switchbacks to Cascade Pass, a 3.7-mile hike that gains about 1,800 feet to an elevation of 5,392 feet. In summer near the trailhead you can find Sooty Grouse, Black and Vaux’s Swifts, Olive-sided Flycatcher, Hermit Thrush, MacGillivray’s, Yellow, Yellow-rumped, Townsend’s, and Wilson’s Warblers, and Slate-colored Fox Sparrow. At the pass, look for Clark’s Nutcracker, as well as Hoary Marmot and Pika. To reach the alpine zone, cross the pass and continue down the other side for about 100 yards. Here the rough Sahale Arm Trail branches off to the left and goes north for about a mile and a half, following the ridgeline that marks the Cascade Crest (Columbia River drainage to the east, Skagit River to the west). The first mile is steep and rocky. The trail becomes gentler upon reaching Sahale Arm, a widening of the ridge, beginning at 6,300 feet elevation and ending at about 7,000 feet. “Sky gardens” along the way have many colorful wildflowers; Sooty Grouse are common in this habitat. Look for White-tailed Ptarmigan, American Pipit, and Gray-crowned Rosy-Finch on the broad, heather-covered slopes of Sahale Arm. Another good place for Gray-crowned Rosy-Finch (and spectacular scenery) is Sibley Pass, reached by turning east from Cascade River Road onto Sibley Creek Road (FR-1540) about 10 miles above Marblemount (13-plus miles if coming down from Cascade Pass, on the right). Drive another 4.5 miles to the trailhead. Take the Hidden Lake Peak Trail, which for the first mile climbs through forest and then breaks out into the meadows of Sibley Creek basin. The saddle to the east is Sibley Pass. Take the switchbacks for about another mile until you reach an area where the trail straightens, traversing along a series of meadows and talus slopes. Leave the trail here and make your way a final mile up to the pass. In September, several hundred Gray-crowned Rosy-Finches have been observed foraging along the steep cliffs. Be watchful for Golden Eagle. Six miles northeast of Marblemount, SR-20 enters the North Cascades National Park Service Complex. In about four more miles, look for the Whatcom County line sign (0.5 mile east of milepost 116). Park here, taking care not to block the gate, and walk south to the Skagit/Whatcom County Line Ponds and access to the Skagit River. This attractive riparian area consists of a mixture of deciduous (mostly Black Cottonwood and Red Alder) and conifer forest. In late spring and summer, Hammond’s and Pacific-slope Flycatchers, Red-eyed Vireo, Swainson’s Thrush, and Yellow-rumped, Black-throated Gray, and Townsend’s Warblers can be heard and seen. American Redstarts nest here—their only confirmed breeding site in Western Washington. In winter, Bald Eagles congregate along the river and pond to feed on salmon that have spawned and are dying. Check the ponds for Hooded Mergansers and other waterfowl. This is a good place to compare Common and Barrow’s Goldeneyes. American Dippers can be seen swimming under water, plucking salmon eggs off the bottom of the pond and bobbing to the surface to swallow them, then submerging again to repeat the process. Drive another 1.7 miles and turn off right onto a gravel service road (0.1 mile east of milepost 118). Park here, again making sure not to block the gate. (Do not drive through the gate even if it is open; you might get locked in.) The Newhalem (Aggregate) Ponds can be reached by walking west along the road until it crosses a spawning channel. Go left, then right to get to the main pond, a second pond, and the Skagit River, or continue straight to the north edge of the main pond. Waterfowl and Bald Eagles use the ponds in winter. During the breeding season, woodpeckers, flycatchers, vireos, thrushes (including Veery), warblers (including American Redstart), Western Tanagers, and finches are abundant in the riparian growth between the spawning channel and SR-20. East on SR-20, stop in 1.7 miles at the Goodell Creek bridge for American Dippers (present all year). On the right in another 0.1 mile is Newhalem Campground and the main visitor center for the park complex, well worth a visit. Back on SR-20, turn right and in another 0.5 mile enter the town of Newhalem (no services, except for a general store). Check the steep hillside and brushy area on the left for Violet-green Swallow, Orange-crowned, Nashville, MacGillivray’s, and Wilson’s Warblers, Western Tanager, Pine Siskin, and Evening Grosbeak. Colonial Creek Campground, on Diablo Lake, is 10 miles east of Newhalem on SR-20. Turn right into the south unit of the campground and drive the one-way loop to the amphitheater and the Thunder Creek Trailhead. MacGillivray’s Warblers nest in the shrubs near the amphitheater, and a pair of Barred Owls is resident here. Hike the first mile of trail along the lake to the bridge over Thunder Creek. Check the excellent riparian habitat at the creek mouth for Red-breasted Sapsucker, Olive-sided Flycatcher, Western Wood-Pewee, and a variety of songbirds. Barrow’s Goldeneyes nest here, and Harlequin Ducks are seen occasionally. For the next 29 miles the highway climbs steadily through superb alpine scenery to Rainy Pass. Stop often at the many pullouts to look and listen for Sooty Grouse, Black Swift, Hammond’s Flycatcher, Townsend’s Solitaire, Hermit Thrush, Yellow-rumped and Townsend’s Warblers, Lincoln’s Sparrow, and Western Tanager. In about 21 miles (0.5 mile past milepost 151), Red-naped Sapsucker, Pine Grosbeak, and White-winged Crossbill (erratic) are often seen at the Easy Pass Trailhead. In another 1.6 miles (0.1 mile past milepost 153), turn left into a gravel pit and park so as not to block truck access. Walk to the uppermost edge of the gravel pit, and follow a steep, poorly marked trail uphill through the woods. Spruce Grouse are occasionally seen along the edge where the trail emerges from the trees at the lower end of the Hardy Burn, below Mount Hardy. The burn has been good for Northern Goshawk, Golden Eagle (flying along the ridge above), woodpeckers (although the burn now appears to be too old for American Three-toed and Black-backed), Clark’s Nutcracker, Mountain Bluebird, Townsend’s Solitaire, and Red Crossbill. Calliope Hummingbird, Red-naped Sapsucker, Dusky Flycatcher, and Lincoln’s Sparrow have been seen by the edge of the gravel pit near SR-20. The picnic-area parking lot at 4,855-foot Rainy Pass (4.6 miles) is a good place to look for Northern Pygmy-Owl. Gray Jays, both species of crossbills, and other mountain finches may be present along the easy first section of Maple Pass Loop Trail 740 and the side trail to Lake Ann (1.8 miles, 700 feet elevation gain). Trail 740 continues steeply after that for 2.2 miles to Maple Pass (6,600 feet); White-tailed Ptarmigan have been found on the slopes above the pass. The trail loops back to Rainy Pass (7.5 miles total). The five-mile hike north along the Pacific Crest Trail to Cutthroat Pass offers the possibility of Spruce Grouse, Mountain Chickadee, Bohemian Waxwing (late summer–early fall), Pine Grosbeak, and crossbills, as well as other mountain species. It is another 4.8 miles to Washington Pass on the divide between the Methow and Stehekin River drainages—the highest point on the North Cascades Highway (5,477 feet). Turn left into the rest stop entrance road 0.3 mile east of milepost 162. The meadow north of the highway is a good place to look for Spotted Sandpiper, Mountain Bluebird, American Pipit, and other alpine nesters. A short, paved trail leads to a scenic overlook of the upper Methow Valley. Look here for Gray Jay, Clark’s Nutcracker, Red Crossbill, and an occasional Pine Grosbeak. The highway descends along the east slope of the Cascade Range, giving access to birding sites on the Dry Side (page 424).